Mark Garrett is alive, which, among his group of friends from 25 years ago, puts him in the tiny minority. That Garrett is 58 and living with HIV puts him in a growing demographic: People with HIV are aging, as a group. Although younger people still represent the majority of HIV patients, the profile is shifting: The Centers for Disease Control and Prevention estimated that in 2009, people 50 and older represented one-third of people with HIV in the U.S. By 2020, they’ll constitute half, based on CDC data. The shift results from both longer survival with the virus, made possible by medications, along with new infections among older people. In Garrett’s case, it’s been a matter of survival. Before his diagnosis in 1988, the Spokane native had moved from Alaska, where he worked for a big oil company, to Northern California, where he worked in water treatment and built a home in the redwoods. He suffered no symptoms, but he knew as a sexually active gay man he needed to be tested. The positive result was soon followed by an AIDS diagnosis. Among the dead is Garrett’s then-partner, who died in 1994. 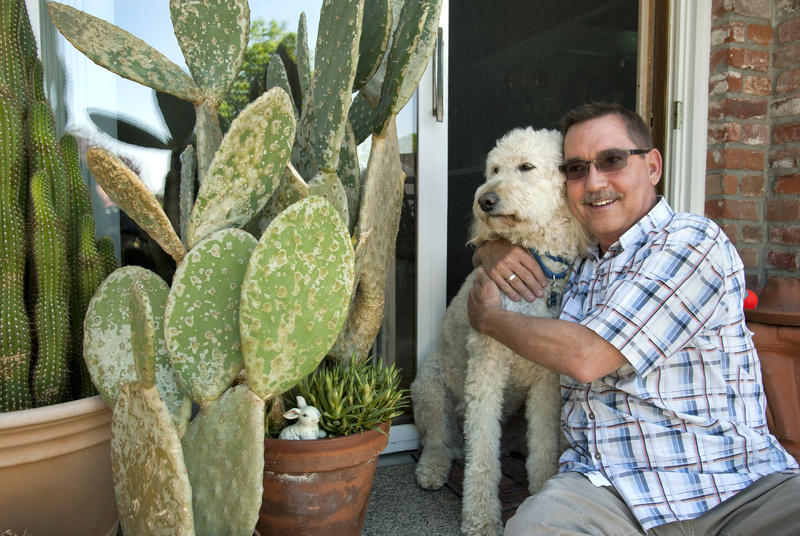 More than two decades later, Garrett is working as an advocate for others with HIV through the Spokane AIDS Network, looking forward to projects at the north Spokane home he shares with his partner of 17 years, spending time with his new dog, Aiden, left in his care by a woman who died recently of AIDS. But Garrett lives daily with the aftermath of the virus and its treatment. His immune system has been damaged. While the drug regimen for some people with HIV amounts now to just one pill a day, Garrett still takes 15 to 18. Five fight the virus itself. Two or three treat direct side effects of the first five. The rest are to treat what Garrett called the “aging process” – for him, like many older people who’ve been living with HIV for years, it seems to have accelerated. Garrett has bone density loss, degenerative disk disease, early indication of kidney disease, prediabetes, arthritis, high cholesterol. “They say if you have a compromised immune system, you have AIDS, you’re probably aging about 10 to 15 years faster than others,” he said. Physically and mentally, Garrett feels a lot better than he did before he started taking the medications that pulled him from the edge of death. Because his “viral load” is down to undetectable levels, he’s much less likely to transmit the virus. He’s glad to be able to advocate on behalf of others with HIV. Before the introduction of life-preserving drugs in the mid-1990s, “opportunistic infections” usually ended AIDS patients’ lives. Now, for many people, living with HIV and AIDS is more like living with a chronic illness – or, especially for the older Americans who are infected, a collection of chronic illnesses. Cardiovascular disease, kidney and liver disorders, bone weakness and fractures and certain cancers seem to occur at higher rates among older people with HIV than among their peers who aren’t infected, according to a 2012 paper by researchers from the CDC and the Johns Hopkins School of Medicine. • HIV itself contributes to other chronic conditions, partly because of the inflammation that results from the virus’s replication in the body. • HIV drugs are sometimes toxic. • Adults with HIV are more likely to have other risk factors for health problems, including hepatitis B and other infections, and are more likely to be smokers or obese. Coulston treated Spokane’s first HIV patient before anyone knew what HIV was. These days it’s relatively simply to treat HIV itself, Coulston said. Although the virus has mutated to resist multiple drugs in some people, the majority of patients do well, he said. “The micromanagement of their other health issues is what’s more important,” Coulston said. When AIDS meant you were likely to die and effective treatment was something you dreamed about, Mark Garrett and his friends, like many people, took desperate measures to try to live. It was the late 1980s and early ’90s. Treatments were slow to develop. The first government-approved treatment – azidothymidine, or AZT – was “horrible,” he said, and seemed neither to improve nor extend life. They drank hydrogen peroxide in an attempt to cleanse their blood. They burned their skin with photographic acid to try to activate their immune systems. In retrospect, Garrett said, they were trying to maintain hope. It was amid those desperate conditions that scientists in 1996 identified a class of drugs called protease inhibitors as the “missing component” in HIV treatment. Protease inhibitors stop the virus from replicating, Eastern Washington University researcher and assistant professor Bipasha Biswas explained to a roomful of students at a recent HIV and AIDS conference at Spokane Community College. With less of the virus in the bloodstream, the immune system can grow stronger. She gestured toward panels from the AIDS Memorial Quilt hanging in a room at the college, commemorating people who’d died. If they’d lived long enough to receive them, she told the crowd, protease inhibitors might have saved them. “People started seeing this dramatic effect: ‘Wow, I don’t need to die of AIDS anymore,’ ” Biswas said. But protease inhibitors came with their own problems, some of which endure for older people with HIV. Along with nausea, diarrhea, headaches and other side effects, the drugs caused lipodystrophy – the redistribution of body fat, causing wasted-looking faces and humped backs – and contributed to a higher risk of cardiovascular problems along with diabetes, kidney stones and diabetes. These days, HIV drugs are easier to tolerate, Coulston said. Patients suffer less from the “overt toxicities” – the nausea, the diarrhea, the headaches. Others are trying to resume lives, or build anew, despite HIV. Ann Bruce is one of three caseworkers who work with people with the virus at the Spokane Regional Health District, helping ensure they take their medication – reducing their viral loads – and connecting them with doctors and counselors along with substance-abuse, housing and financial-assistance programs. The health district serves 182 clients with HIV, half of whom are 45 or older. Bruce and other caseworkers refer clients to community college programs that aim to help residents return to work, a state program for job-skills testing, and other organizations that provide help creating résumés – “all those kinds of things that they never thought they’d need,” Bruce said. Although the health district’s HIV program is open to any resident, most clients live on low incomes. Besides HIV, they tend to face other struggles, Bruce said, including substance-abuse and mental health problems. Of the latter, depression is most common, she said. Feelings of isolation among older people with HIV often stem from the stigma that remains around the virus. Garrett, the client advocate at the Spokane AIDS Network, said romantic relationships can be hard to come by for older people with HIV. He hears it often from participants in the organization’s support group, he said: They’re lonely. They want to date. “What we have is a population that became disabled for various reasons, and now that isolation, that not fitting in, is being amplified,” Garrett said. Spokane resident Dale Briese, 49, remembers a period in 1995 when he attended funerals on 17 of 18 consecutive Fridays. As someone who’s far outlived the two-year prognosis he received with his HIV diagnosis in 1985, mental-health care has been vital, he said. Therapy has helped him address his ongoing life with the virus and the trauma of those early years, he said. Briese recently went to SCC to look at the AIDS quilt. The panel he created to honor his first partner was among those on display. They received their diagnoses together, six days before Briese’s 21st birthday. He worries that if HIV gets labeled a chronic illness, people could forget about how serious it was and remains. He worries that the AIDS quilt will be forgotten – that HIV deaths will be classified as cancer deaths, for example, even when the virus precipitated the cancer. He fears that funding for HIV prevention and treatment will dry up. For his part, just into middle age, he suffers fewer physical ailments than many of his peers. He declined to take HIV drugs until about 10 years ago, focusing on holistic strategies – switching to a vegetarian diet, losing extra weight, working out regularly – to maintain his health. Briese works as an administrative assistant in Volunteers of America’s community-housing program. He wants to continue helping others in the community, he said.